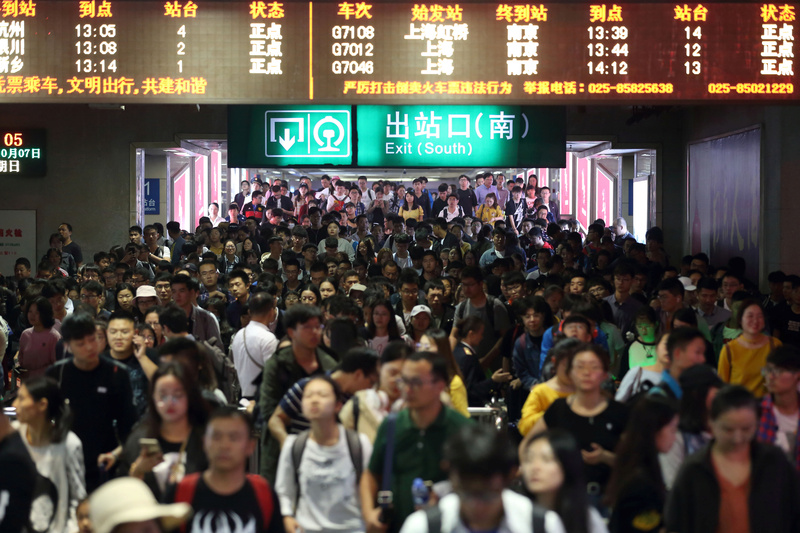 Arriving passengers throng the exit of Nanjing railway station, at the end of the National Day "Golden Week" holiday, in Jiangsu province, China October 7, 2018. Picture taken October 7, 2018. The number of domestic trips made during the weeklong National Day holiday rose 9.4 percent from a year ago, to 726 million, according to estimates by the Ministry of Culture and Tourism released on Oct. 7. Travel receipts increased 9 percent to 599 billion yuan ($87 billion). The holiday took place between Oct. 1 to Oct. 7. A State Council document issued on Sept. 20 said the government would encourage innovation in consumer finance and expand loans to boost consumption, among other measures.